Can Capcom forget the mistakes of the past and bring one of its most beloved franchises into the modern era of action gaming? The time has come, and so have I, as Devil May Cry finally makes its triumphant return. 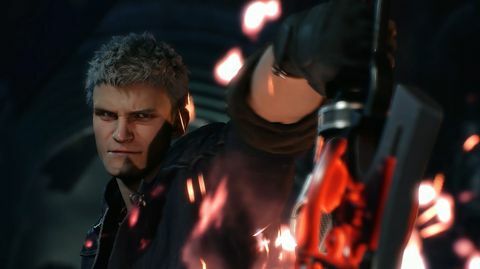 It has updated and polished the original formula that made the series a hit – taking cues from what worked in past instalments’, and even in Ninja Theory’s 2013 reboot, making Devil May Cry 5 a long-awaited return to form for veteran fans as well as a great jumping off point for newcomers. The story follows Dante, Nero, and mysterious newcomer V as they aim to take on the demon king Urizen, who has grown a colossal, unholy tree in the middle of Red Grave City and unleashed a demonic invasion that threatens all of humanity. Each of the three leads has their reasons for taking down this new threat, and the plot does a great job of shedding light on character backgrounds, relationships and motivations. 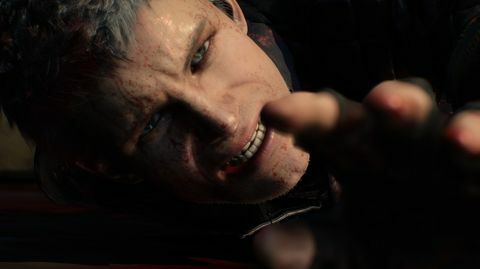 With many well-placed callbacks to prior games, leading to some very emotional scenes, DMC5 holds nothing back and will surprise even the most jaded of fans. It also expounds on the lore via collectible notes and letters, even tying into the anime. Fortunately, if this is your first Devil May Cry game, there is a short film in the main menu entitled “History of DMC” that succinctly summarises the previous entries in chronological order. The series’ iconic hack-and-slash gameplay is back in full force with its focus on building stylish, varied combos using everything in your arsenal, increasing your Style meter and earning the highest possible mission score. The already refined combat has been further polished so that every gunshot and sword swing gives a sharp, satisfying impact. And you can finally run and shoot at the same time instead of being locked into a walking animation. At certain points in the story, you will switch between the three main leads, each of whom has a distinct playstyle. At certain points in the story, you will switch between the three main leads, each of whom has a distinct playstyle. Nero retains his Red Queen sword and Blue Rose revolver, and his move set is almost identical to his debut in DMC4 – being equally balanced for crowd control and single-enemy fights, as well as having high mobility. 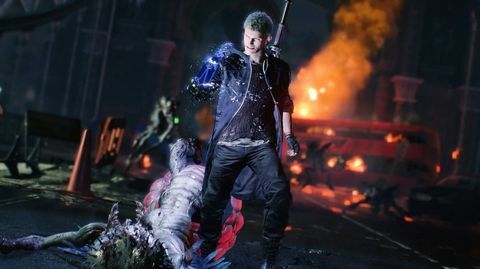 The main change to him is his new arm; having brutally lost his iconic Devil Bringer to an unknown assailant, Nero is now equipped with his new Devil Breakers. These are a set of mechanical arms that each has unique functions, ranging from a simple shockwave attack to a guided missile that you can hop on and ride (and even a few joke ones in the deluxe edition). Each arm also has a supercharged ability that, once used, instantly destroys the arm and immediately equips the next one from Nero’s belt. Taking damage while using a Devil Breaker ability also causes it to be destroyed, meaning they cannot be used with impunity as his Devil Bringer could. Dante also plays mostly the same as his DMC4 iteration; in addition to his diverse arsenal of melee and ranged weapons; he also retains his four Styles. Each Style has a different specialisation, such as one that focuses on quick movements and dodges, or another that grants additional attacks for melee weapons. Like in DMC4, he can switch between these on the fly, opening up even more possibilities for stylish combos. 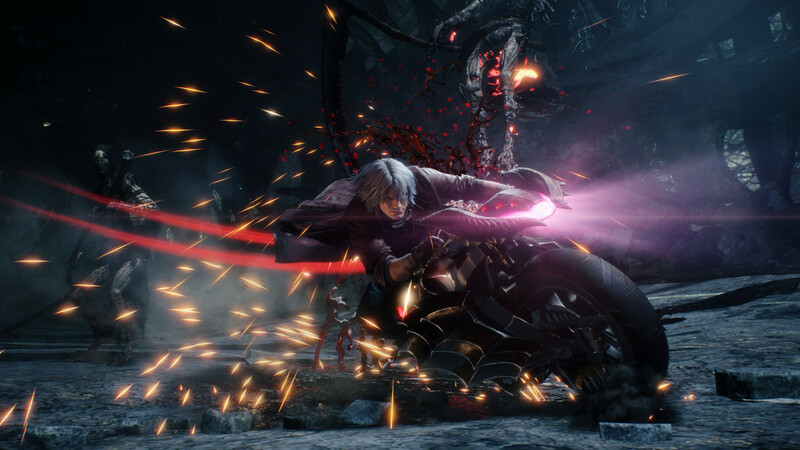 Dante’s Devil Trigger also returns, temporarily transforming him into a powerful demon while granting him health regeneration, a boost in strength and speed, and the ability to glide – something he hasn’t used since DMC3 – making him an absolute powerhouse of versatility. players will need to be aware of the familiars’ locations onscreen as well as V’s, making him the most difficult, and at times frustrating, character to master. V is the most unique of the three, as he does not attack himself. Rather, he summons his three demonic familiars to fight for him – two of whom are controlled by the melee and shoot buttons, while the third is summoned by activating his Devil Trigger and fights automatically. They also aid in his evasive and movement abilities, and each has its own health bar separate from their master’s that recovers when they are close to him. When a health bar depletes, that familiar will then enter a cooldown state. As such, players will need to be aware of the familiars’ locations onscreen as well as V’s, making him the most difficult, and at times frustrating, character to master. Once you get the hang of him, you will feel like a complete badass – especially since his familiars can keep attacking while he taunts. You will never face your demonic foes unprepared, as the customisation menu has received a complete overhaul. As before, you can purchase new skills for each character – at the cost of Red Orbs as DMC4’s Proud Souls have been given the boot – with the option to try before you buy, a feature that was present in Ninja Theory’s DmC. Restorative items and Holy Water have also been removed, encouraging players to rely on their skill and health drops to get them out of a tight spot. You can still spend a Gold Orb to instantly revive yourself from death, at the cost of a reduced mission score, which is fine; but you can now also spend your normal Red Orbs for the same result, which seems pointless as the game is rather heavy-handed with its Gold Orbs, no longer limiting you to three at a time and even awarding you one as a login bonus. Historically, Devil May Cry’s puzzles have often been lacklustre at best and frustrating at worst, so focusing purely on combat and exploration is a welcome change. The biggest change to the customisation menu is your loadout; you can equip Dante and Nero with as many or as few weapons and Devil Breakers as you please, and even save your selections as presets, allowing you to slay your enemies precisely the way you want. 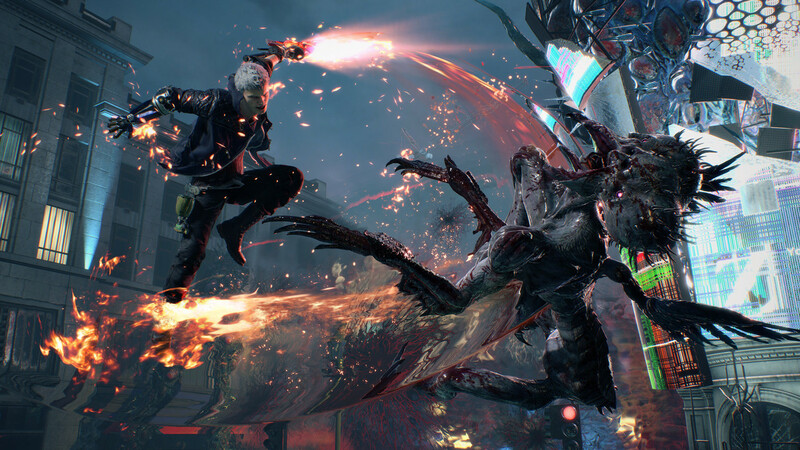 Though DMC5 is primarily a single-player experience, it does contain an online feature known as the Cameo system. During specific sections where the main leads are exploring the same area, players (or their ghost data if none are available) who are doing the same mission as different characters will appear in your game with a small notification showing their usernames. This feature is, unfortunately, underused as (with one exception) you will only see them off in the distance. At the end of missions where Cameos take place, players will then be able to rate each other as “Stylish”, and earning enough of this rating will reward the player with yet more Gold Orbs. This system has little effect on gameplay and could have been cut altogether, but catching a brief glimpse of another player fighting demons does grant a sense of unity – rather like a small-scale version of Thatgamecompany’s Journey. Puzzles have been sacrificed in favour of the combat, with most obstacles aside from platforming consisting of slashing up weak points in the tree’s roots, or finding and introducing a demonic parasite to them to rot them and open the way forward. Historically, Devil May Cry’s puzzles have often been lacklustre at best and frustrating at worst (remember the dice game? ), so focusing purely on combat and exploration is a welcome change. Some quality of life changes include holding down the left stick to aim the camera towards your objective, saving you from getting lost or accidentally progressing when you wanted to explore; and the ability to replay already-discovered Secret Missions from the menu. DMC5 features photorealistic character models with gorgeous facial animations and stunningly lit environments, running at a smooth 60fps even with all the flashy attack and environmental effects onscreen. It borrows from DmC’s visual design in terms of its modern setting, introductions for new enemies and killcams that heighten the adrenaline of battle. The enemy and boss designs themselves are all unique – with both brand-new demons and returning ones from prior games given a visual overhaul for the current generation. A staple of the DMC series has been the unlockable skins for the player characters. Unfortunately, like in DMC4’s original release, there are none aside from the Super costumes and preorder bonuses, the latter all being palette swaps of the originals. DMC5’s soundtrack is one of the best in the series, containing brand new tracks as well as remixes of old ones. And if you don’t like any of the new battle themes, you have the option to switch them out individually for others from any of the previous titles. The voice acting and dialogue are cheesy and over-the-top in typical Devil May Cry fashion, while still tugging at your heartstrings when they need to. Both the English and Japanese voice cast bring their A-game, even if Griffon’s English voice sounds eerily like Gilbert Gottfried at times. 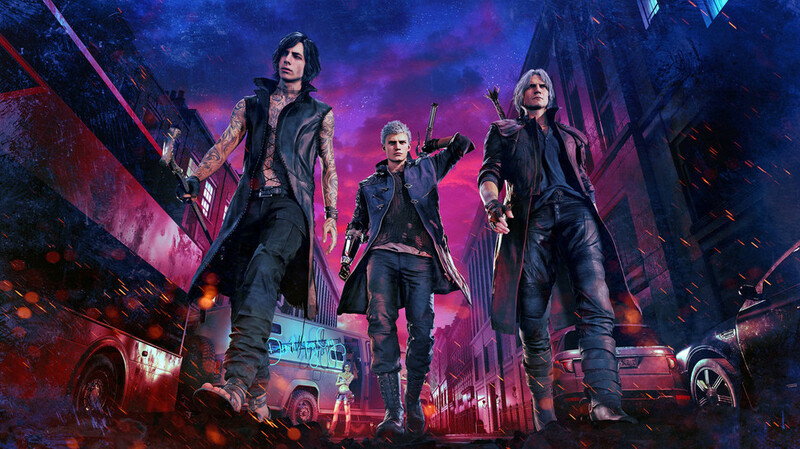 In spite of a few odd choices, Devil May Cry 5 is a terrific return to form for the series, learning from its predecessors and amalgamating their strengths into a warm welcome for new fans and a welcome home for veterans. 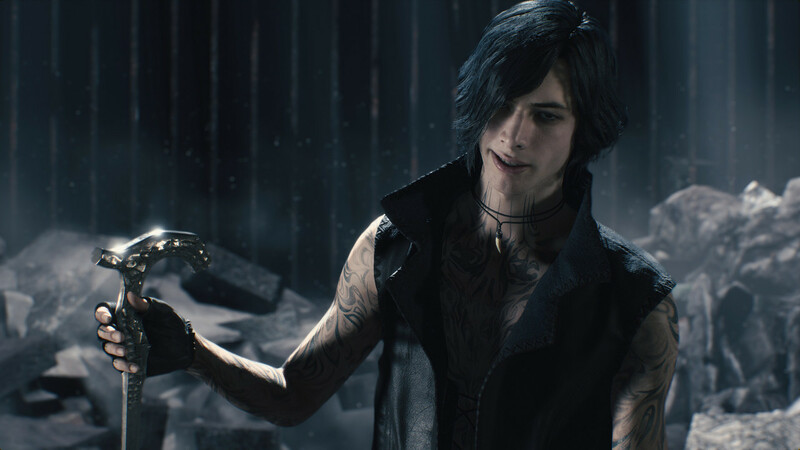 Devil May Cry 5 keeps what made the franchise so popular while refining its systems to near-perfection. 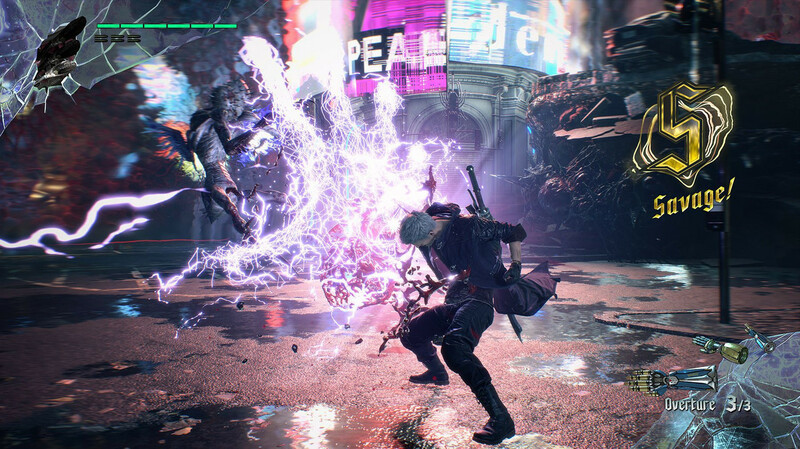 With some of the most impressive animation and combat out there right now and the addition of Bloody Palace arriving in a free update this April, Devil May Cry 5 is the definitive DMC experience and should be played by everyone looking for incredibly satisfying & stylish combat! Ups Emotionally driven plot. Accessible to newcomers. Polished, strategic and satisfying combat. Unique player characters. Deep level of customisation. Puzzles tossed aside in favour of improved combat and exploration. Quality of life improvements. Stunning visuals, stellar voice acting and a rockin’ soundtrack. Downs Too easy to revive from death. Underused “co-op”. No extra costumes. Did he just hit that monster with a motorbike? !